This non-operative, outpatient procedure is designed to provide relief for patients with arthritis of the knee. The technique allows the physician to inject an inflammation-reducing steroid with maximum accuracy. In preparation for the procedure, the physician swabs the knee, injects a numbing medication and positions a hand-held ultrasound probe that will allow the physician to visualize the anatomy of the knee and accurately inject the medication. 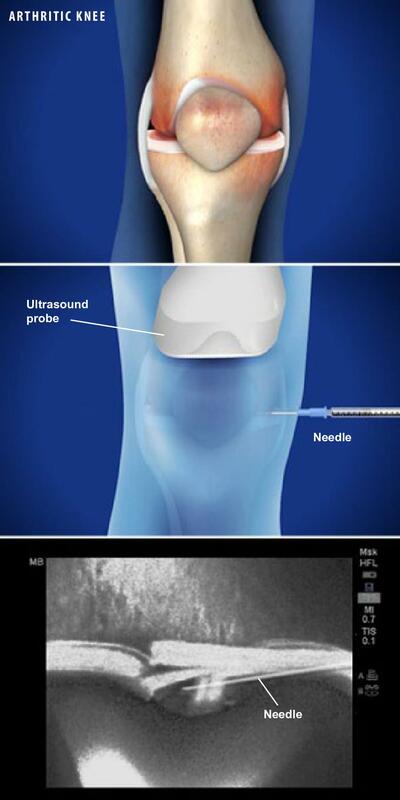 The physician inserts a needle into the knee and guides it to the problem area using ultrasound imagery. The medication is then injected into the joint. When the injection is complete, the needle is removed. The local anesthetic and steroid solution in the knee joint will reduce inflammation and pain. The injection can be repeated if necessary.